Creativity is in the details. It pushes boundaries, builds experiences, sees possibilities and fosters teamwork. It asks why, and connects everything. Today, we’re seeing a shift toward more creative work at the office. The need to be creative in our jobs to solve problems and help stimulate growth is not reserved solely for artists or designers, but for nearly everyone everywhere. To be creative is to be human. In this digital world where technologies emerge and pervade in overwhelming ways, we are faced with multiple challenges and opportunities for reaching new levels of innovation. Contrary to popular belief, creativity is not some “eureka!” moment; it’s a process in which everyone can engage if the conditions are right. To collaborate well, to solve problems, to attain the correct solution – people need to be creative. By having a multi-functional environment supportive of all the ways we work and think can help people achieve success. To be successful in the future, workers need to generate new ideas, solve tough problems and think outside the box. As a result, they need to be creative. Despite the fact that people can probably work from anywhere these days, the general need and desire to do creative work is luring people back to the office and back to their teams. Back to places where technology is accessible and our experiences with it are easy and hassle-free. It’s known that ingenuity is born from teamwork and that collaboration energizes people. Therefore, by working together, employees can devise new and better ideas and improve upon processes. And with convenient access to power and tech in a thoughtfully designed office, people are able to conveniently plug in and really hit the ground running. The places where people use their technology can have a significant impact on the experience people have with that technology. And similarly, its availability in the workplace makes a difference in the efficacy of the actual workspace itself. A 2016 Gallup poll indicated that 87% of workers seek forward-advancing companies and often view the inclusion of technology within the workplace as a strong indicator of success. And according to the Steelcase Creativity and The Future of Work Survey, 77% of employees believe creativity is the 21st century job skill. When employees have the choice to enter a vibrant, open space or private area that accommodates their work task and energy level, productivity soars. Creativity is unleashed. The number one employee request, according to Gallup, is flexibility in the types of areas where one can work within an office and convenient access to a variety of communication tools. These tools, such as video conferencing technologies, have emerged to define the environments where they may be used. The implementation of technology to actively create an atmosphere of calm and focus has rapidly become one of the most requested services when developing workplaces today. In the past, work was driven by efficiency. The process was intentionally linear and divided into areas in which people could specialize. The problems we face today are so much more complex – they require creative thinking and a very different work process that allows people and ideas to diverge, converge and iterate. So now, it’s time to shift. It’s time to blur the edges of how, when and where we work. It’s time to create the right conditions for creativity. To do so, people must be able to envision what their team and business needs. They also change the way they view the physical space and its impact on building a creative culture. As a result, when that mindset is altered, it’s very possible to move the needle on innovation. We believe leaders of emerging businesses and innovative teams within large organizations. They want to disrupt, question, test and challenge the status quo. It’s that pursuit of fresh thinking that opens doors to new opportunities and creative solutions. Creative work has a rhythm – an ebb and flow. People want and need a new set of creative tools (places and technology) designed to support the different stages of this iterative process in which everyone can participate. We need time alone to focus or rejuvenate as much as we need time with small and large groups to generate and refine ideas. We need cloud-enabled technology that is both mobile and integrated into the workplace, allowing our ideas to follow us wherever we go, whether working alone or together. 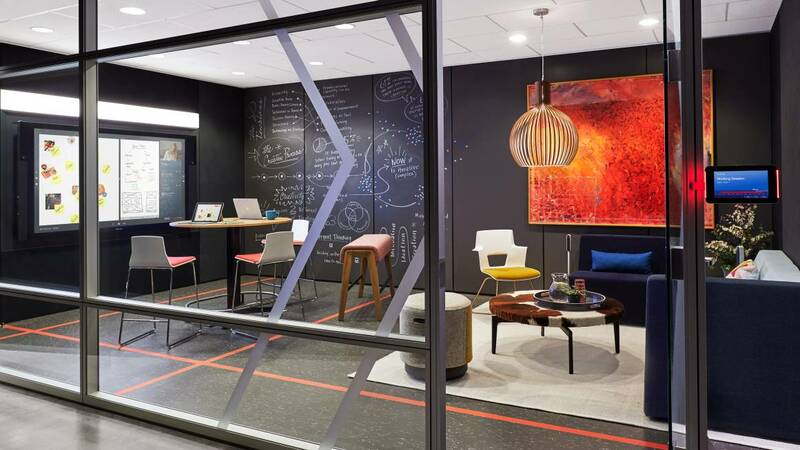 Most of all, creativity in the workplace is in demand – it’s time to design workspaces that support it. Learn more about Creative Spaces or schedule a showroom visit.